It's Wednesday and you know what that means… I'm over at the Paper Craft Crew for the Weekly Card Sketch Challenge! Come on over and check out this weeks sketch as well as the Design Team submissions. The challenge starts today and ends on Tuesday, March 10th @ 11:50 PM ET – We would love to see your creations as inspired by the Paper Craft Crew Card Sketch. Today, I'm sharing with you an Easter Card I created using the For Peep's Sake Stamp Set which features the Bokeh background. I'm in love with the Bokeh Background and can't wait to share a video with you which I've filmed but haven't finished editing yet so keep an eye open. There are actually two methods that I know of for doing the Bokeh Technique and I'll be sharing the Sponge Method. As for the card itself, the base is Whisper White and the card base is Marina Mist layered with the card front featuring the Bokeh technique. I stamped the sentiment from the "For Peep's Sake" stamp set with Marina Mist then added the floral accents with the Candy Dots. Don't forget that the "For Peep's Sake" is available for only a short time through the Occasions Catalog and you can purchase the stamp set by clicking on the "Shop Now" button. Go ahead and try a new technique! The Bokeh Technique with the sponging is fun and really easy. Sponge a colorful background using either 2 or 3 colors. 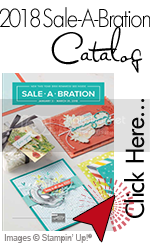 Create a template with circles cut out by using the Stampin' Up! Window Sheets and the Circular Framelits. The actual Bokeh effect is created by using the Craft Whisper White Ink sponged over the original colors already applied to the card front. The essentials hardware clips are a fun way to add an accent to a card. I highly recommend these cute little clips as a wonderful addition to your crafting stash. I placed Candy Dots coordinating with the Marina Mist for the center of each flower. Flowers are a great accent for Easter and Spring Themed cards. Here is this weeks Card Sketch with the Paper Craft Crew. If you are having a mental creative block, card sketches are a great way to kick start your creative juices. Why not stop over at the Paper Craft Crew, create a card inspired by this weeks Card Sketch and post to the blog! To purchase the products used on this beautiful project, visit my 24/7 Stampin’ Up! store by clicking HERE! For your convenience, I've also included a supply list at the end of this blog post which you can also click on to be taken directly to my 24/7 Stampin' Up! store to purchase the products used. I also invite you to pin any of my creations to Pinterest and to share your thoughts or questions by leaving me a comment. I love hearing from all my readers – word of mouth is one of the greatest forms of flattery. You can also follow me on Pinterest! PreviousWeekly Deals – Are you a Happy Shopper?